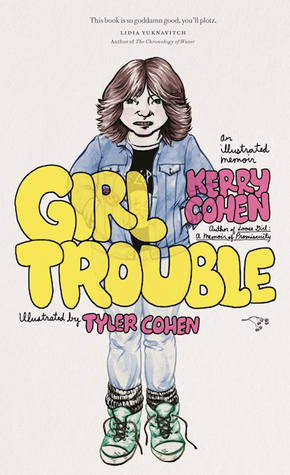 I read Kerry Cohen’s memoir “Loose Girl” a few years ago, so I decided to see what this book was about. This is a memoir that chronicles the author’s very complex relationships with women, beginning with her older sister and continuing throughout her childhood to the present day. Each relationship is presented vignette-style, with illustrations of several of the characters included within. Some of the relationships Cohen discusses are friendships, others describe a contentious situation (i.e., the author being bullied by another girl), some girls are passing acquaintances. I certainly understand Cohen’s reason for writing this book. It seems that she wanted to not just talk about girl relationships but to examine the many, many ways in which women can be cruel to one another. There are problems with this, however. One of the main ones here I noticed was that the author seems quick to discuss the many times in which she has been victimized by girls and women, yet minimizes her own actions in some situations in which she was equally cruel. Case in point: a period during the author’s college years in which she admits that she slept with a friend’s boyfriend. She tells us that the boyfriend was not really her friend’s boyfriend, just some guy she was seeing at the time. Either way, when the cheating was discovered, her friend stopped speaking to her. The author meets up with the friend years later after she writes about it in “Loose Girl” and tries to explain herself, yet her tone is not one of contrition (after all, she did go and write a book about it) but one of slight indignation, as if the friend just should have ‘gotten over it’ already. There’s other layers here of meaning I could talk about here, but it’s repetitive. After a while each “friend” and each “boy” all sounded the same and reading this became tiresome. And the illustrations, while good, didn’t really add anything to the book. Picture here, more words. Picture there, more words. Blah. Even though I get the point, I can’t help but to feel that this is essentially the same book as “Loose Girl,” only with a slightly different focus. Many of the same incidents from that book are retold here.